When I visited Geoff and Alex to see the conservation and inventory work in action, I was immediately greeted with a vivid description of the bugs and larvae one encounters doing such work and an offer to see an illustrated poster – not for the faint of heart! Clothes webbing house moths seem to appreciate the house as much as we do. Unfortunately, they are not the ideal housemates as they destroy wool and other protein based materials (for example, horsehair upholstery, feathers and silk). 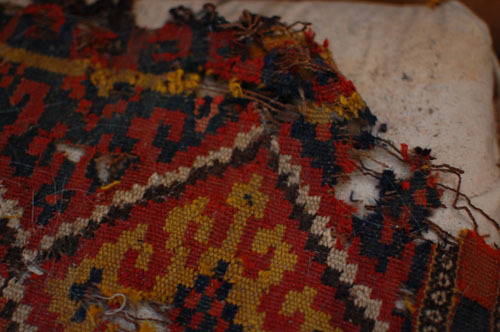 To the right, you can see evidence of moth activity on one of the kilim cushions. The kilims will need to be deep-cleaned because of this issue and the sheep-skin rugs, particularly affected, will be frozen. 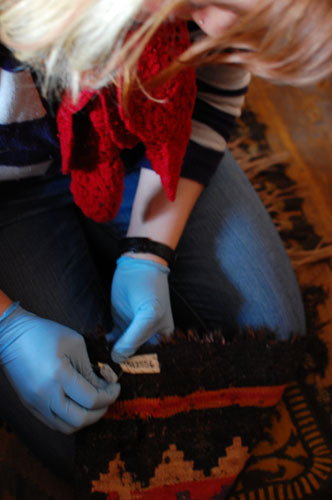 Here Alex is sewing fabric inventory labels onto the kilims, being careful not to cause them any further damage. The team is taking measures to stop the moths in their tracks in order to protect the vulnerable textiles. To the right is a blunder trap – a little folded card trap with a sticky adhesive inside. 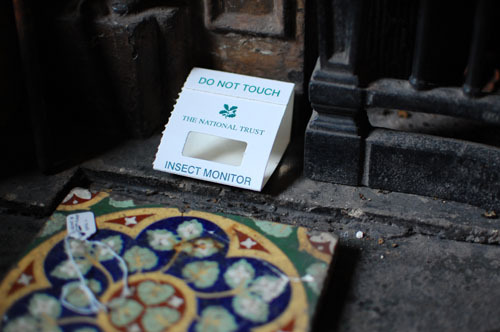 After identifying the insect species causing the problem, the conservators can add a pheromone vial to the blunder trap. This emits the attractant to all of the adult males in the vicinity, the moths get trapped onto the sticky adhesive and a generation is wiped out as they are unable to reproduce. Take that, bugs!